Photographed in pelagic waters off of Farnsworth Banks, Catalina Island. Equipment used included a Nikonos V with a 15mm lens, and a single Ikelite Substrobe set at 1/2 power. F-stop was f-11. About Pelagia: Found in a wide range of locales, with a disc size of up to 18 inches in diameter. 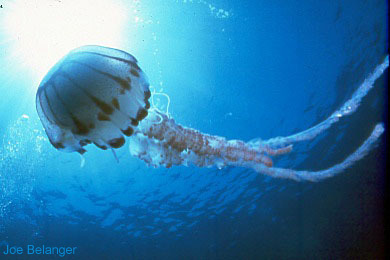 These are pelagic animals (live in open ocean) and often support other life, such as the two medusa fish living inside the jellyfish's bell. Anything that touches the tentacles usually dies from the torturous stinging cells the jellyfish possesses in its tentacles, hence the nickname fiery torch-of-the-sea. Photographed at Ship Rock, Catalina Island. I used a Nikonos V and a 15mm lens with a single Ikelite Substrobe 150 set at 1/2 power. 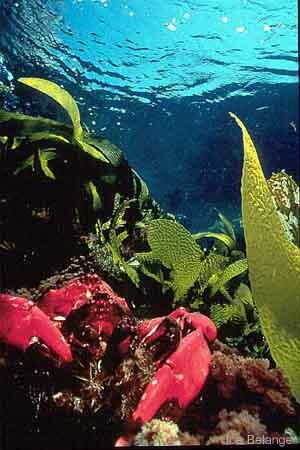 About the Kelp Crab: Found mostly in kelp environments in shallow water, but can be found in up to 250 feet. 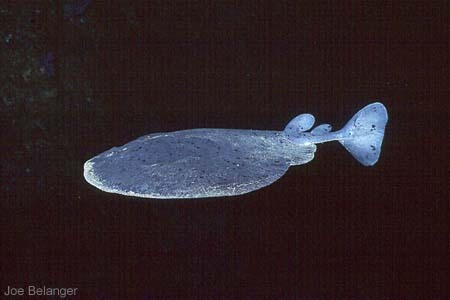 During springtime, the lucky diver will happen upon two mating adults, as in this picture. This was shot in very shallow water, in about 3 feet, while I was sifting through palm kelp. The little crabs appeared in a passion for privacy, as the big red male protects the smaller purple crab and her brood of eggs from human intrusion. Their carapace (the shell portion without the legs) is about four inches in diameter. Photographed at Catalina Island, these giant fans make beautiful subjects and are a favorite for underwater photographers. I shot this picture with a Nikonos V and 15 mm lens with one Ikelite Sub Strobe 150 held out to the side. 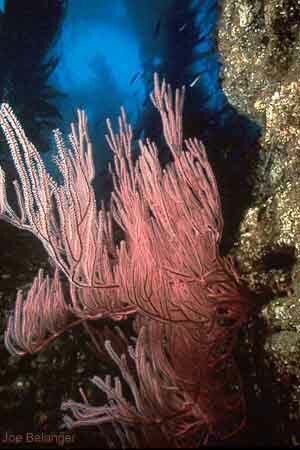 About the Red Gorgonian Seafan: Found in depths to 150 feet in areas where current is typically present. Each white speckle is an individual animal, so the sea fan is actually colonial. Varying conditions and predation can leave nothing more than bare branches. Range from Monterey Bay to the San Benitos Islands, Baja California, Mexico. Photographed at Santa Barbara Island at the rookery. Water was rough and too rough to use a strobe, so I shot available light only and shot at a shutter speed of 250 th of a second to freeze the surf grass. Exposed at f11. I used a Nikonos V and 15mm lens. 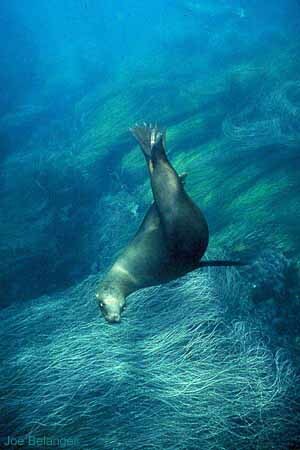 About the Sealion: These animals of circus fame abound in Southen California and around the world and are real characters in the water. This one did a ballet in the water for me in five feet of water. They grow to 6 feet in length. Photographed in 140 feet of water at Farnsworth Banks, Catalina Island. Picture was taken with a Nikonos V and 15 mm lens with two strobes (Ikelite 150 and Substrobe Ai placed out to either side of the animal. Exposure was f11.